Caribou Coffee is dipping its toe in the latest trend — nitro coffee — by offering the beverage at two of its 615 locations. The chain is introducing the coffee this month at the shop attached to its Minneapolis support center, as well as at a drive-thru location in nearby St. Louis Park, Minn., and plans to expand the test to 25 additional locations across the country in February, according to Andrew Kraus, Caribou Coffee Co. senior manager of food and beverage innovation and management. 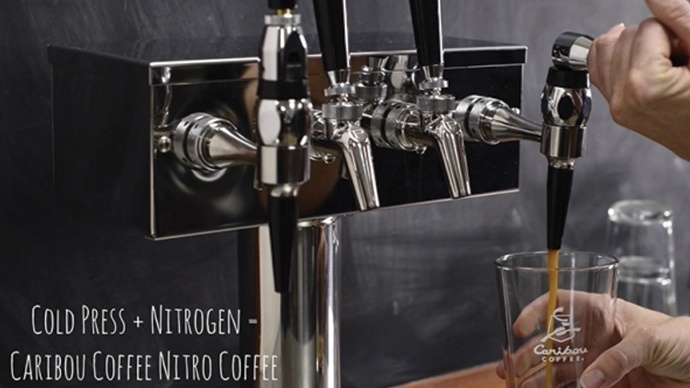 Nitro coffee is made by infusing cold brew coffee, which Caribou has offered since the company launched in 1992, with nitrogen gas to give it tiny bubbles and a creamy mouth feel. Similar to carbonation, which uses carbon dioxide instead of nitrogen, the process is also what gives Guinness beer its distinctive texture. For complete article on NRN.com, click here.